Hannah Waterman Arnold nurtured her children with a gentle, but firm hand and instructed her son to “always choose that your companions be your betters, that by their good example you may learn.” Benedict attended school in Montville, but in 1752, he was sent to a private school under Hannah’s kinsman, Dr. Cogswell, in Canterbury. It was the expectation that Benedict would attend Yale. Benedict was taught subjects such as English, mathematics, logic and history. Hannah was a pious woman and instructed Cogswell to attend to her son’s religious education. The Arnold family lost Absalom in 1750 due to an illness (April 4, 1747 – July 22, 1750). Benedict was away at school when a deadly diphtheria epidemic swept through Norwich and claimed many victims, including two of his younger sisters. Mary, (June 4, 1745 – September 10, 1753), and Elizabeth (Nov 19, 1749 – September 29, 1753) tragically died nineteen days apart from each other in 1753. Hannah was the only child at home to survive the epidemic. The loving Arnold parents were devastated by the loss of their children. Many colonists drank heavily, but in 1753, Captain Arnold’s drinking affected his business and family’s financial welfare. Captain Arnold used alcohol to numb the pain of his failing business, the loss of his three children and the uncertainty of what the future held. With his father out of work and alcohol problems intensifying, the family could no longer afford Benedict’s private school. 14-year-old Benedict was forced to drop out of school, ending any hope of receiving a gentleman’s education. Dr. Daniel Lathrop was born in Norwich in 1712 and upon his graduation from Yale in 1733, he traveled to London to study medicine. Lathrop returned to Norwich and opened an apothecary shop in 1737 selling the merchandise he bought in Europe. Lathrop’s younger brother, Joshua, joined the business after graduating from Yale in 1743. The brothers imported medicines, fruits, wines and fine goods from Europe and often traveled to select their stock. In 1744, Dr. Daniel Lathrop married Jerusha Talcott and the couple had three boys, but tragically, all three succumbed to a fatal epidemic in infancy. Captain Arnold’s ill heath prevented him from teaching his son the family mercantile business, so Hannah secured an apprenticeship for Benedict with her cousins Dr. Daniel and Joshua Lathrop who operated a successful apothecary shop and merchandise trade. Arnold apprenticed with the Lathrop Brothers from 1754-1761 and he impressed them with his skill. They made Arnold their junior business associate in New Haven and sent him on trading voyages to the West Indies and London where Arnold gained valuable experience as a mariner and a merchant. While living in the loving home of Daniel and Jerusha Lathrop, he matured into a gentleman and learned how to operate a business. The Lathrops cared for the Arnold siblings following the death of their mother in 1759. The community empathized with the Arnold family’s loss of their children, but pity turned to contempt as Captain Arnold’s public drunkenness shamed the family until his death in 1761. 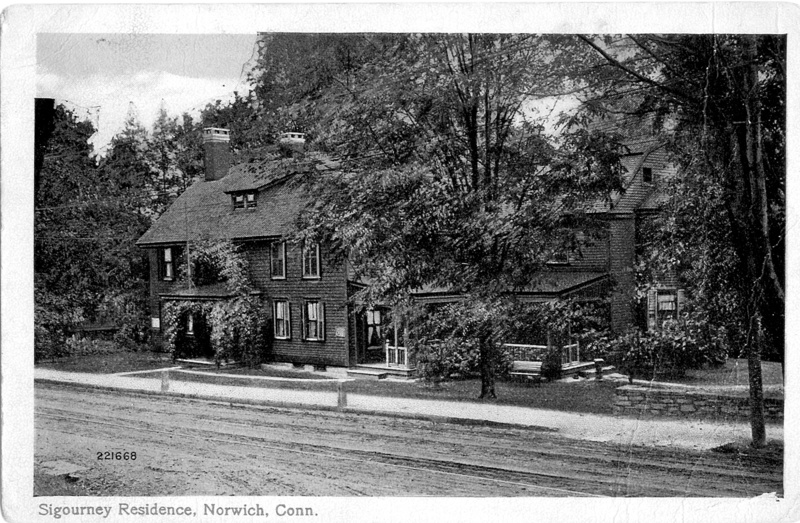 In 1764, the Lathrop Brothers helped Benedict sell the Arnold homestead and Benedict and his sister Hannah moved to New Haven, putting their childhood years in Norwich behind them. Arnold became a successful druggist and merchant in New Haven. He endeavored to restore honor to his tarnished family name, but ironically, his betrayal during the Revolutionary War ensured that his name would forever be remembered as one of a dishonored traitor. The home is a center hall house with a c. 1900 “Library” ell on the right side. The main structure is a mid-18th century, gambrel roofed, center hall twin chimney house. A fire in 1818 resulted in the removal of the twin chimneys and the construction of the current four chimneys. Ezekiel Huntley was the Lathrop’s gardener. His daughter, Lydia, fell under the maternal care of Mrs. Lathrop. Lydia Huntley was born in Norwich in 1791 and attended the East District School, which was progressive because it taught both boys and girls. Lydia was treated as a member of the Lathrop family and benefited from the privileges it provided. Lydia opened a school for girls in Norwich in 1811, but took her school to Hartford when she married Charles Sigourney, a wealthy merchant, in 1819. Lydia Huntley Sigourney was a prolific poet and published her first volume of poetry in 1815 called Moral Pieces in Prose and Verse in which she wrote about her upbringing in Norwich. After Mrs. Lathrop’s death in 1806, the Huntleys moved to a home in “Little Plain,” then joined their daughter in Hartford. Another literary giant to live in Lathrop Manor was pronounced feminist, social reformist and author Charlotte Perkins Gilman. Born in Hartford in 1860, Gilman is well known for her short story “The Yellow Wallpaper” which details a woman’s decent into madness and is often compared to the deterioration of her marriage to Charles Walter Stetson. After divorcing Stetson in 1894 and sending their daughter Katharine to live with Stetson and his new wife, she reconnected with her cousin Houghton Gilman and the two were married in 1900. 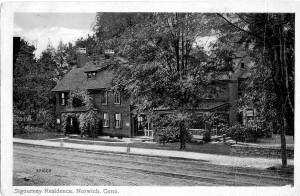 They moved back to Houghton’s native Norwich in 1922 and lived in Lathop Manor until Houghton’s death in 1934. After his death, Gilman moved to California to be with her daughter. Shortly after, Gilman was diagnosed with an incurable breast cancer and she chose to take her own life in 1935.